Grow Lagurus ovatus seed for this delightful little annual that is excellent for cutting and preserving. This is one of those ornamental grasses that you grow first on a whim, then as an integral part of your garden! 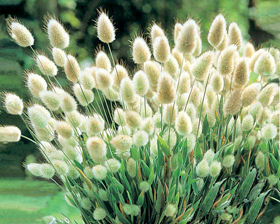 Commonly known as both Bunny Tails and Hare's Tail, this ornamental grass is neat and compact, topped by chartreuse puffballs that really do resemble little rabbit tails! Sow direct in March/April for flowering in July/August or sow in a cold frame during autumn. Bunny Tails Grass germinates easily from seed. The plant does not tolerate much disturbance so direct sowing in spring or autumn is best. Grow in full sun and in ordinary well drained soil. Germination 10-12 days. The temperature change (day to night) will improve the germination.